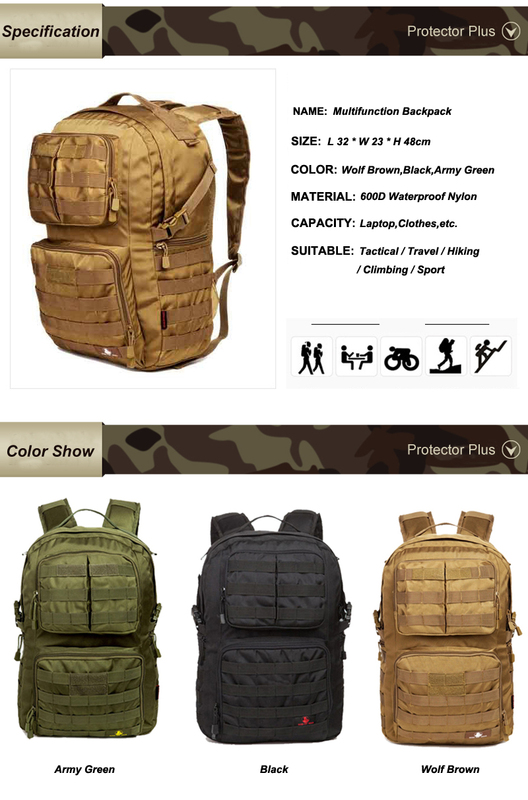 Military backpack is made of quality polyester fabric, durable and water-resistant. â€?Tactical assault backpack has molle system, Molle webbing throughout for attaching additional tactical pouches or gear as 3 day assault pack bug out bag backpack molle hunting backpack. â€?Military assault pack backpack with double-stitched, Heavy duty zippers and utility-style cord pulls, Side and front load compression system, Ventilated mesh padded back area & shoulder strap,breathable and comfortable. â€?Military backpack has hydration compatible that works great for a hydration bladder (backpack didn't include hydration bladder) as hydration backpack or outdoor camping hiking backpack.